The clear solution to breakouts and blackheads. Keep stubborn breakouts and blackheads at bay with this 2% salicylic acid (BHA) exfoliant. The leave-on formula penetrates deeper inside pores, clearing breakouts and reducing inflammation without the use of irritating ingredients. Its silky fluid texture leaves skin feeling soft and hydrated. Customer Care: Hello Ron, thanks for your comments! We are always looking for ways to improve our products, so we will pass along your feedback to our Product Development team! I purchased this as part of the full extra-strength travel set after having a really bad breakout from stress and new makeup. When I started using this (about 2-3 weeks ago) my cheeks were covered in red, painful cystic acne and now almost all my breakouts have gone flat. Since this product is a chemical exfoliant, my skin has been pretty dry and flaky (so that's not the cutest look ever) but it's worth it for the results it provides. Also, you can remedy this by not using it as often. The only reason I didn't give this product 5 stars is due to the fact that once opened, the container leaked whenever it was laid on its side (e.g. in my travel bag). If you don't buy any other product in the kits, I'd highly recommend this exfoliant. I bought this after reading all the great reviews but sadly I'm having the same experience as one or two other reviewers in that the first few days I used this it seemed to be having good results but over the last 3 or 4 days I have broken out in whiteheads all over and in places like my forehead where I don't normally suffer breakouts. Oh well it was worth a try and if it works for you then great, mine is destined for the bin sadly. And the packaging is very leaky but ok if stood upright. This stuff saved my skin!! After suffering awful hormonal breakouts from stopping the pill this brought my skin back to former glory! Great product. Not drying at all. Love this product. It has greatly reduced red patches on my forehead, around my nose and on my chin. I’d had these red patches since being a teenager and this has got rid of them. My skin feels soft and looks even in skin tone. I can’t say it’s done anything for blackheads, but I’m happy with it anyway. I’ve recently started using it on the tops of my arms for keratosis pilaris and they definitely feel smoother, which is a start. I have found that you need to use it daily for a while before you get a result, I think I was two thirds way through before I noticed. I use it once a day at night after cleansing, just like you would a toner. Give it a few minutes before moisturising. Enjoy! Sarah - Better than prescription medication! I discovered Paula's Choice products by chance a few moths ago and am converted. I've been using prescription antibiotics to control breakouts for years and have found the PC BHA exfoliants so beneficial that I've been able to stop the antibiotics which is a great relief for me. I've also LOVE the tinted 30 spf moisturiser. It is the lightest SPF I've found and I've tried loads. It's the best and gives a light, natural and illuminated coverage . I can't say enough good things about this skin care range. My only regret is that I didn't find out about it in my teens. Also love the Resist Anti Aging range for combination to oily skin. Thank you Paula for having the foresight to create this range for 40+ women who have ageing concerns but also oily combo skin. So many other brand anti ageing products are heavy and greasy and not at all suited to oily combo skin but the Resist products are perfect. Biene - Brilliant but packaging on the trial size is pants! I ordered the trial size because I only use this in my t-zone in addition to the Resist Daily Pore Refining BHA which I use all over and I have absolutely no complaints about the product. It is an extra oomph for troublesome areas especially for my mature combination skin. The packaging on this trial size however, is awful. As soon as you turn it upside down the product runs into the twists of the screw top and then down the outside of the bottle - wasting a lot of product. I now take the entire lid off but it's a bit of a faff and it will impossible to take away on holiday because of this. Customer Care: Hi Biene, thanks for your comments! Good to hear you like the Clear Exfoliant! Regarding the packaging, we are always looking for ways to improve our products, so we will pass along your feedback to our Product Development team! BeabyB - Finally something that works! I have tried so many products over the years, - having spots since my teens and getting the worse breakouts ever in my mid 30s, I was so skeptical anything would work for my dry, cystic acne skin. I stopped buying antispot products because all they did was smell and feel terrible, never work and dry my skin out even more. A friend recommended PC to me, and after using this for two months, I'm sticking with it and have ordered another bottle. I've seen a huge reduction in my pores and hormonal breakouts during my cycle are much reduced. I even went two weeks without any new spots for the first time in DECADES - it really boosted my self esteem! It is a little sticky when you put it on, but just I leave it for a few minutes before moisturizing. I've always been the girl with the worse skin in the room, but this product has given me hope. Thanks Paula! I have tried so many products for blackheads but this is the only one which actually works for me. I can never be without this again! This product has completely changed my teenage daughter's skin, she is so happy to have no more breakouts, clear skin and a very simple skin routine! A small price to pay for a happy 15 year old!! I am 27 and have had a really textured, bumpy forehead since about 23. The spots never really come to a head, but instead are thousands of tiny, headless pimples. I had been hunting online for a diagnosis and remedy. I found a forum with people discussing 'Closed Comedones' which sounded very similar to what I had been suffering with. Lots of people recommended Paula's Choice BHA exfoliatants as a remedy, so I purchased some to give it a go. The results were outstanding, even after just one application. I used this at night, after I cleanse. Then I wait a while before using a retionol night cream. The product itself is amazing and has completely cleared up my skin. I have really problematic skin - very sensitive and have struggled in the past with eczema, yet I also have very spot-prone skin. The only fault is that the packaging leaks and I am unable to take it with me if I'm travelling. Also have found that I go through the bottle really quickly, having already gone through two - bought my first one in January, finished that and bought another in March, and needing to repurchase again now. However, I love this product a lot so I am willing to spend the money. I've had acne since I was a teen and I really like this product as it reduces the severity of my facial acne . I feel I am getting a quality product compared to the standard high street brands who put unnecessary and potentially skin damaging ingredients into their products. However, I am deeply disappointed in the fact that Paula's Choice keep raising the prices of their products every time I go online to re-purchase. How are loyal customers meant to just accept the fact that prices keep going up with no explanation. I want to continue buying these products, but I can see myself getting priced out which is deeply disappointing. Fades red marks apparently. Nope, made my skin redder. Customer Care: Thank you for your review. We are sorry to hear of your experience with this product. While this response is not typical, we do understand that each customer is uniquely different in how they will respond to products or ingredients. It is best to gradually build up use of a BHA product, starting to use it a couple of times a week only. If there is no adverse reaction this may be increased to every other day at night and then, if you wish, every night. Some people increase use to twice daily (morning and night) but it really all depends on the condition of your skin. Please feel free to contact our team should you need further advice. This is excellent! I feel its strengths lie in being alcohol free, non irritating and having a minimum number of ingredients. It did not increase my redness, though you may want to use a trial size first if you are unsure how it will suit your skin, especially if you have sensitive skin. This worked better than the regular strength, even though both have 2% salicylic acid. This is very effective at reducing spots and smoothening the skin. I think it will work over time to reduce the visibility of the pores/sebaceous filaments on my nose. This product really helped clear up my acne, I use this in the morning after cleansing then benzoyl peroxide at night. The only downside is the packaging, it does tend to leak badly when placed on its side. This is my second time repurchasing this product after trying out other products. I trust Paulas products and formulas and certainly have good results with this exfoliant, it was a bit drying for the first 2 weeks but after that my skin got used to it and I can use this product as much as I want without a problem! Fantastic! Unfortunately the biggest and frustrating problem with this product is the packaging, it constantly leaks if you are travelling with it. I often stay in hotels/ travel and I like my night time regime, yet I have wasted half the bottle in spillages! This keeps happening at every occasion, and now I have a few drops left when I left with a half full bottle! I don't understand why this hasn't been addressed yet, seeing as other people have made this complain in the comments. Simply add a screw cap to this bottle (other brands do this like Pixi Glow Tonic etc). It's not rocket science and won't cost that much in production, again seeing as other affordable brands do it! I will empty my other brand morning toner bottle and will fill it with Paulas Choice exfoliant next time I buy! But this shouldn't really be necessary from a commercial product. Please please redesign your product as we want to buy it again! Customer Care: Thank you for your review. We're glad you're liking your CLEAR Extra Strength formula! Regarding travel, it's tricky as no skin-care product packaging is designed for this purpose. Once a product has been used, especially liquids, it's quite difficult to keep it from seeping out unless the product is packaged in an air-reduction pump. We're happy to see that you've ordered the Skin Perfecting 2% BHA Liquid Exfoliant, which is exactly the same formula in different packaging. We will also forward your review to our Production Team. Absolutely love this product. I have quite sensitive skin so was apprehensive to try something new. I'm so happy that i did as my skin is already looking great. The product itself is, I think, excellent – it clings to my skin and sinks in quickly, it doesn't dry it out, and since I have been using it my skin's appearance has improved overall. I have found the packaging a problem, however. I put the product in my wash-bag to travel once, and noticed after that a third of the product had leaked out. I did it again, by mistake, and I lost another third. If you buy it, I would recommend that you don't travel with it – from now on, I will decant it! Customer Care: Thank you for your review. We're glad you're liking your CLEAR Extra Strength formula! Regarding travel, it's tricky as no skin-care product packaging is designed for this purpose. Once a product has been used, especially liquids, it's quite difficult to keep it from seeping out unless the product is packaged in an air-reduction pump. You could consider trying the Skin Perfecting 2% BHA Liquid Exfoliant, which is exactly the same formula in different packaging. However, we see that you've already been in touch with our customer care department and the matter has been solved. I normally never write reviews but this product has actually saved my skin. I had read all the amazing reviews on it but no product had ever really made any difference to my skin at all, so I didn't really get my hopes up. Within about two weeks everyone was commenting about how glowy my skin looks and I was able to stop wearing foundation. It's crazy but I feel like my skin looks worse with makeup on now! As though it covers up the 'glow.' Yes, I still get the odd hormonal break out but not as often now and they clear up really fast. I'm on my fourth bottle and will keep buying again and again! This has to be the best product that I have ever used for my skin, it has literally transformed my skin and really helped with pigmentation, redness, uneven skin tone etc. I could see results after a day or 2 of using it. I have never used paulas choice before but I love this product so much will defiantly be buying more! I put the product on straight after cleansing and drying my face then let it soak in for about 5-10 mins before applying moisturizer, I wouldn't say its as effective as BP for acne but it really does transform the look and texture of your skin on the road to clear skin! James - Bottle cap broken already - half of liquid lost! I can't comment on the effectiveness of the product yet, but unfortunately the bottle it comes in has already broken. The cap is pretty stiff and when opening it for the very first time last night, it simply SNAPPED OFF! I really did not use excessive force either. Not ideal. To compound matters, as I opened my gym bag to use the solution this morning, I found around half of the product had leaked all over my bag (as the cap can no longer be properly secured). This is very disappointing indeed. I do hope Paula's Choice get in touch with me as I am so far not a happy customer. Customer Care: We are very sorry to hear about your experience, we have contacted you regarding this issue. I've been using Paula's choice BHA exfoliants for a long time, so I thought I'd switch to this stronger solution as I have bad acne and oily skin. Unfortunately the stronger solution seems to have just exacerbated my skin issues and my skin is now very sore, itchy and red, with new cystic acne breakouts on my chin. I normally love Paula's Choice products and I'm sad that I invested in this rather than the less strong BHA exfoliant I usually purchase. Would I be able to send this back in return for a different BHA exfoliant? Thanks. thank you for your review. We are sorry to hear of your experience and discomfort. Although this is not a common response, we do understand that each customer is uniquely different in how they will respond to products or ingredients. This product has totally changed my skin, I have suffered from acne for 2.5 years leaving scars. since using this product for only one month I feel that I have new skin. After only one week i could see a difference. I'm so happy with the results cannot recommend enough! Customer Care: Thank you for your review. We are very happy to hear that you are seeing great results with this product, it is indeed one of the best! I've been using this product for about 6 weeks & I cannot speak more highly of it. I had adult acne which at times had got quite severe & had really effected my confidence. I like most people with acne had tried a lot of products before & I never had found anything that worked so had almost given up on ever thinking I'd have clear skin. I was recommended to use this product by a friend & for that advice I'm truly thankful. The product is lightweight & therefore feels nice & soothing of my skin. After application my skin feels cleansed but not stripped or tight. The first week of application I saw a slight dryness to my jaw line & neck, but it only lasted a day or so. But other than that, I had no adverse side effects. If I'm honest I didn't see any huge improvement in my acne straight away. I was still getting spots after week 2 & 3, however I did notice a glow in my skin. My skin was moving away from looking angry & inflamed to a much smoother complexion. Then from week 4 I noticed my spots were very minimal & the dark red marks on my face from previous spots were beginning to fade. By week 5 & 6, dramatically improved look in my skin. Only now getting a very small pimple once a week. Which is a huge huge improvement! The only down side of the product is the packaging. It's a real shame as the bottle leaks. I tried to take on holiday & the whole bottle ended up going everywhere. I did address this with Paula's choice & they took on my feedback. However, as the product is such a success for me, it certainly hasn't put me off. I will definitely repurchase this product. Thank you Paula's choice. Customer Care: Thank you for your feedback, we are very pleased to hear you have contacted our Customer Care team already. Anonymous - Sensitive acne and blemish prone skin will love this product! It's absolutely brilliant!! Growing up as a teenager I never had acne. I was known as the girl with the flawless complexion. When I moved to the UK in my mid twenties I started having dry skin and breaking out. My skin became so uneven and red. ( I am african with complexion a little darker than Rihanna's complexion). I went to the dermatologist and used loads of products. I tried natural things and I gem went as far as avoiding certain food. Yet my acne got worse with each year. A friend recommended this product and the price was quite a turn off but she convinced me to try it. I finally tried the cleanser and BHA normal strength. The pimples dried off after the first application but pimples still kept coming at the exact location. I say this with all honesty all my pimples are gone!! And I can eat what I want and yet no pimples or flare ups! Also my complexion is brighter and I say this as an African who used to be hyper pigmented. Paula's choice canned my skin for good. I jut ordered another set even though my previous one is not finished that's how I stock up. I am in the 2nd month of using these great products!! Customer Care: Thank you for your review and for sharing your experience with us. We are always delighted to hear success stories from our customers. I've previously used only AHA for anti-ageing purposes, but because of recent stress, frequent travelling and hot summer (heavy chemical spf 30/50 products I've been using), my skin had broken up pretty badly. Having mild acne, wrinkles, and sun-spots all together isn't a great look, and weirdly I got pretty bad acne on my neck which looked angry and red... I ordered this sample, and just a few days with BHA product sorted me out, and after a week following with the same regime, there are no marks, scars, absolutely nothing apart from clean clear skin. I used up a sample, but will be purchasing full size product, great work Paula's team! I have combination skin and suffer from hormonal acne which flares up from time to time. This is the one product in my skincare routine that I truly feel makes a difference in my skin and helps towards keeping it clear and radiant. It is quite strong but that is what I love about this product - there are enough active ingredients to actually make a difference unlike most overpriced products in this category on the market. I only wish PC would sell this product in a larger size as I run out of this quickly. Packaging can also be improved and this leaks BADLY when traveling. Customer Care: Thank you for your review. We're glad you're liking your CLEAR Extra Strength formula! Regarding travel, it's tricky as no skin-care product packaging is designed for this purpose. Once a product has been used, especially liquids, it's quite difficult to keep it from seeping out unless the product is packaged in an air-reduction pump. You could consider to try Skin Perfecting 2% BHA Liquid Exfoliant, which is exactly the same formula in different packaging. Order the sample size which I've had for three weeks and will probably finish in a week, so I back to order the full size! This product for me truly helps prevent my breakouts, I have tried Proactiv in the past which aggravated my skin to no end and caused more blemishes. When I use this product every day I have clear skin. However it does dry out your skin and leave it flaky so I exfoliate every day and especially before the application of make up. I also take days off in between and my skin stays clear. I use the product by literally squirting the solution on my clean face and gently smoothing it over with my clean hand in a downward direction. I haven't noticed a major improvement in my blackheads but they are minimal to begin with. I use it to control spots, and and general break outs. Love it, and it will become one of my staple bathroom products ! I have tried everything, having had breakouts since my teens, into my thirties. This product changed my skin. I no longer have ANY problems!! I always had to be careful with what cleanser and moisturiser I used, as they would cause me to break out as well, but using the exfoliating solution means I can use whatever moisturiser, and my skin stays clear. I never thought it would be possible, but this is the best product I have ever used! disappointed! I had clear skin before after I used for a few days now my face looks horrible, it makes me dont want to go out or see anyone. There's alot of huge pimples and redness all over my face and very sore. I spent about 50£+ on your product. Its very expensive and very bad for my skin. Customer Care: Thank you for your review. We are sorry to hear of your experience. While it's possible your skin may not be able to tolerate salicylic acid, what's much more likely is that the exfoliation this BHA product provides loosened clogs deeper in the pore lining, causing them to surface all at once, thus resulting in more breakouts. For many who experience this, it's a temporary issue that resolves with ongoing use of a BHA exfoliant. We understand your hesitation to go back to using this product, but suspect if you stick with it you really will see clearer skin. If you remain unhappy, please contact our customer care team. I have had hormonal cystic acne for 3 years. It always flares up in week 3 of my menstrual cycle. In addition, I have whiteheads on my chin which are due to congestion plus the hormonal imbalance. This product is fantastic, it will not clear your face overnight, but it will speed up the life cycle of the blemish and with continued use, it will clear your congested skin. Use this at night and leave it sitting on the skin for optimum results. This is a good alternative to Benzoyl Peroxide which made my very oily, Indian skin flake like crazy and made it impossible to cover blemishes. I bought both the Regular and Extra strength versions, and found the Regular is perfect for me but the Extra is more than my skin needs. My skin isn't usually sensitive, but reacted to this Extra Strength BHA with blotchiness, tingling and itching. I tried using it about three times now, on evenings when I haven't used a BHA in the morning, and it's still the same, so I think my skin just doesn't like this formula. I'm giving it 3 stars though because I have no doubt its effective if your skin can tolerate it - the Regular Strength version has done wonders for me. Just buy a trial version first and get a refund if its not suitable for you. I love this exfoliating toner! I use it daily, evenings only. I have tried so many exfoliating toners - but none that has given me as good of result as this one. I wake up with glowing and calm skin! My skin is sensitive/oily, but it I can still cope with using this daily - sometimes it can be a bit too drying on my skin, but then I just skip it one evening and it is back to normal. I would say if the normal strength does not give you the right result, try this one. Start using it every other day first, then try it daily. The results speaks for themselves. I've been using this for a couple of months now and had really high hopes I have blackhead prone skin with a lot on my nose and chin area, occasional breakouts on my chin (which had became much worse recently)after research I thought this would be the ideal product for me! my skin seemed to get worse after using this and I initially thought it was "purging" as it seemed all the pimples were trapped blackheads being pushed out? however once they healed another blackhead would appear in its place which would then turn into a big sore pimple and so on... so after waiting it out for months hoping it would improve, this process just never stopped! so now I still have the blackheads, pimples and my skin is probably worse now then when I started :( I was considering trying retinol but am worried the same thing will happen? Customer Care: Thank you for informing us about your findings. We are sorry to hear this product did not work well for you. It's possible your skin just won't respond to BHA (salicylic acid) as well as other exfoliating ingredients, like AHA (glycolic acid is among the best). Please contact us should you need further advice. Having suffered since my teen years with breakouts I have tried every product high end and low end, every remedy, every routine... My skin has naturally got better as I have got older and certain products have really helped. I had never used a chemical exfoliant before until this one about 6 months ago. Of every other product I have tried, this one left me with the most visible change. I use it at night and in the morning my skin in almost pore less, tight - looking, and blemish free. I rarely re-order products as I like to try new things but I have re-ordered this and will continue to do so. My skin has never been so smooth. I'm very impressed with this. The first time this product stung a bit, but the second time, I applied a PC recovery toner first which I think lowered the ph of my skin from the cleansing step and it went on like a charm. Brill. After using this product for 2 weeks I realized that the occasional big cystic acnes never came back again! I still have occasional small pimples on my face however I suspect there may be nothing that would completely demolish them as I have already taken high dosages of oral meds and yet I still have occasional minor breakouts. However when I first used this product I think I've used too much and this resulted drying, flaking and irritation when applied. After reducing the dosage these problems disappeared however my skin is slightly tight after application and this may be caused by the fact that I don't use a toner after cleansing. As for the blackhead I don't think I have seen any significant improvements yet but I will continue using this product. I might switch to the Resist Daily Pore-Refining Exfoliant if I still don't see any significant improvements. Still, at the end of the day a great exfoliant just not perfect for me. If you have any type of acne this product is a must for your arsenal. This product is amazing for getting an acne flare up under control and then keeping your skin clear. I use it once a day at night following the clear cleanser. The regular strength one broke me out but this one does not - I know the PH is lower so it works harder on your skin but it seems to have less ingredients - so maybe something in the regular strength one did not work for me? Not drying or irritating at all - really helps to keep your skin clear. Once a day is enough. 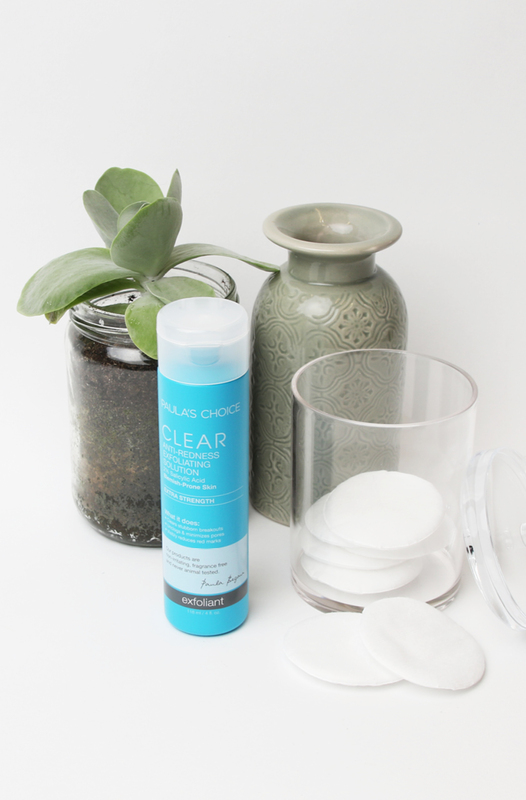 i have tried nearly everything and I am certain that this plus the Clear Cleanser are the 2 key products to getting my acne under control and then keeping it clear and doing it in a gentle way. While I had an acne flare up would use BP on individual spots 5 minutes after using this but now I rarely ever need a BP product. Would definitely recommend this one over the Regular Strength version - seems to work better and no difference in irritation/dryness levels between the two for me. Kharina - Move over Liquid Gold! I suffered terrible acne since Christmas on my left cheek. They were large painful cysts and kept cropping up non-stop resulting I at one point with perfect skin last November and large scars resulting from constant cystic acne concentrated in a very small area. Having been a Liquid Gold fan, it only dealt with the outer layer of my spots, causing bleeding which drove me mad without hope, until I remember Wayne Goss' review of this stuff. BHA is the way to go if you require your acne to get their asses kicked. The relief was instant. After 3 days, the cysts were gone. The deep purple scars gone red, and the red ones gone pink. 2 weeks later, they are all light pink. Don't get me wrong, this will not remove the deep crater scars, but will soften them and prevent new ones appearing. I'm so impressed with the performance this it is my HG product already after 2 weeks. - I don't moisturise after this because it feels oily at first application. - I stopped using it in the morning as I it will with moisturiser make whatever make up slide. - No stinging at all, not like Liquid Gold, so you might think nothing is happening. All in all, a wonderful and affordable chemical exfoliator. Will recommend it and buy again! yaz - Broke me out. the products thst I currently use dont really break me out but as soon as I used this I broke out really bad, I thought this stuff was supposed to help snd prevent breakouts? This has been great for my acne prone skin, keeping it clear and also smoothing the fine lines between my brows. It's less watery than the regular strength version ( I have used both and prefer the extra strength) but still sinks in well. Will be buying the full size once my 30ml one finishes. I have currently been using this product in line with the facewash paulas choice recommended to me for the last month. Well I have re-ordered the wash and going to re-order the exfoliating solution to give it a bit of a chance to work,,,,,,I dont get spots never have done but what I do get is horrendous blackheads and they havent shifted that much to be fair.I am tempted if this next lot doesnt work to try a skin peel as I am the end of my tether,I have followed the rules by the book with my blackhead washing regime,so I will give it another try with this product for another couple of months. I really do like some of the PC products and had been using the regular strength BHA toner for a while with success, but my skin is slighty oily on t-zone and therefore blackhead prone so the idea of an extra strength BHA sounded great... Sadly this product wasn't for me, it left my face both with a greasy film and somewhat shiny! My view is this products finish is not ideal for those with oily skin. I had to stop using my moisturiser it left such a finish which meant no sunscreen. I've noticed the advice under FAQ's for this product but I don't believe that so many people happen to be applying this "wrong" (ie too much) which seems to be the party line (US website has lots more similar reviews) and the idea of blotting with a tissue twice a day! aka adding another extra layer to my beauty routine, doesnt appeal!! To me this is a clear formulation/ product issue which I really hope PC addresses as this has the potential to be a great product.... Customer Care : Thank you for your review. We will certainly pass on your proposal to Paula and het development team. Finding the right exfoliant is not always easy, exfoliants which wor brilliantly for one person may be terrible for the other. We would like to suggest to you to try our Skin Perfecting 2% BHA gel. Please contact our customer care department if you like us to send you some samples. Zahid - Did not see a difference! Am a first time customer of paulas choice and the clear toner was one of the first products I bought from here , I didn't see a difference what so ever. I worked my way up from on application every other day to once every night then twice a day,still no difference I don't have acne but I have a lot of blackheads on my cheeks and some one my neck , I hoped this will get rid of them or at least reduce their appearance but didnt help at all .Most of the product is lost in the cotton ball am nearly done with my bottle and I don't think I will be buying this again. I may buy the BHA gel because I still need an exfoliant and I quite like the idea of not using a cotton ball, It also broke me out a few times which was a bit confusing. However I also bought the skin normalizing cleanser from the same line it is fantastic you can literally see all the dirt in the sink love it not sure about the toner though I need to do something about them blackheads I have.Apart from that I love all the other products I bought work really well . Customer Care : Thank you for your e-mail and we are sorry to hear about your findings.Our customer care department will contact you to find a proper solution for you. perhaps the following article Paula wrote, might give you some extra help. The Paula's Choice Team truly understands the struggle of dealing with those persistent, yucky blackheads. Of course we all know a blackhead when we see one--it's that dark spot stubbornly stuck inside an enlarged pore. Although a blackhead looks like a large speck of black dirt, it has nothing to do with your skin being dirty. •Hormones cause excess oil to be produced inside the pore, which prevents it from flowing naturally to the surface. •The excess flow means that oil gets backed up, and then it mixes with built-up dead skin cells that cannot be shed normally. •When this combination of too much oil and dead skin cells is exposed to air, it oxidizes and turns black. What Can You Do to Get Rid of Blackheads? •Remove dead, built-up surface skin cells that aren't shedding normally. Sadly, lots of products, no matter what they claim, just aren't capable of doing any of the above, mainly because the ingredients they contain actually make matters worse! That's where we can help--The Paula's Choice Team to the rescue! I've Tried Everything! Why Won't My Blackheads Go Away? •Shockingly, lots of products claimed to address blackheads contain irritants--alcohol, peppermint, menthol, lemon, lime, eucalyptus--that actually increase oil production and make matters worse! •Irritation of any kind stimulates nerve endings in the skin that lead to the release of hormones that cause oil production, leading to more blackheads! •You can't scrub blackheads away. Blackheads are too deep in the pore to be removed by surface scrubbing, and the irritation of the scrubbing can cause more oil production. •Blackheads cannot be pulled out of the pore by using pore strips. Pore strips remove only the very surface part of a blackhead, so you'll see it again soon. •Microdermabrasion cannot reach the root of the problem, so any benefit you see from this procedure is only temporary. •Bar soap is a problem for fighting blackheads because the very ingredients that keep bar cleansers in their bar form can clog your pores. Your skin might feel squeaky clean with bar cleansers, but that feeling is drying and irritating, and that won't help any blemish on your face. How Can I Get Rid of My Blackheads? •Use a gentle, water-soluble cleanser and a gentle washcloth to add a bit of manual exfoliation, but don't overdo it. No irritating or drying cleansers should ever touch your face. •Avoid overly emollient or greasy moisturizers in blackhead-prone areas. As much as possible, use only gel, light fluid lotion, or liquid skin-care products because most of the ingredients that give lotions and creams their thick consistency can clog pores. •Use a well-formulated, leave-on salicylic acid–based exfoliant (also called BHA) that contains absolutely no irritants! Unfortunately, there are very few products available that hit this mark. Paula's Choice offers the widest and most affordable selection of BHA (salicylic acid) exfoliants--with options for every skin type (you can check options from other lines by visiting Beautypedia and checking out our list of Best BHA Exfoliants. •Absorb excess oil. Those with oily skin will benefit from irritant-free clay masks and oil-blotting papers. Extremely stubborn blackheads can be removed, but only by gently squeezing them out of the pore. Using a comedone extractor and light-handed squeezing can help a great deal. 1.Wash your face with a gentle, water-soluble cleanser and follow with a well-formulated toner containing niacinamide to improve the shape of the pore. 2.Place a slightly warm (not hot), wet washcloth for about 2 to 3 minutes over the area you want to squeeze, and then pat the area dry. 3.Use a comedone extractor. First, center it over the blackhead and then gently press down and pull forward at the same time. 4.Next, to get more of the blackhead out, use a tissue over each finger (to prevent slipping and accidentally tearing your skin) and then apply even, soft pressure to the sides of the blackhead area, gently pressing down and then up around the affected pore. 5.Repeat this process only once. If nothing happens, it means that the blackhead cannot be removed with this first treatment, and continuing will most likely cause a wound and scabbing. You can try again in a few days..
6.Follow up with a well-formulated BHA (salicylic acid) exfoliant. Remember: Never pinch, scrape, poke, press, or squeeze too hard! Claire - Best product ever! I was using a very expensive brand which was similar to this but contained alcohol and after reading all about various products from the Beautypedia website realised alcohol wasn't the greatest for my oily skin. I bought the CLEAR skin wash along with this and I am now on my 4th bottle of this. It lasts ages and really works. I wasn't expecting miracles but it has made a noticeable difference to my skin. Previously I would change skincare routines all the time but I am to scared to try anything else as this routine works so well! One little suggestion would be bigger bottles in the CLEAR range just to save a bit on the P&P. Catherine - Ruined my skin! I was so excited to try this product, I have been using the Olay Anti Blemish Moisturiser recommended by Paula in one of her reports for a couple of years now and have had great results. The BHA/Benzoyl Peroxide combination worked amazingly for eliminating my clogged pores, and I probably had an actual spot around once every two months. There were still a few stubborn clogged pores remaining, so I thought that switching to the 2% BHA would help eliminate these (the Olay product is 1.5% BHA). The first couple of days my skin looked very nice, very smooth, reduced black heads etc, but then after about 3/4 days my skin started breaking out in red swollen under the skin spots, a type I never ever get. Whilst I had expected some purging, I thought it would be minimal as I had been using the 1.5% for over two years, and am clearly not sensitive to BHA. I decided to stick with it, as I had read so many brilliant reviews, but after 2 months, I had to give up (I thought I should give it two full hormonal cycles to allow it to work properly). This product has ruined my face, I have red marks left from the bumps, the spots made me miserable on very important days such as my graduation, and I wish I had never ever gone near it. I have since swapped back to the Olay product, and my skin is now recovering steadily. I kept all other face products the same while trialling this, so I can definitively say it was this product which made such a mess of my skin. So if you are considering swapping to this, try and find a time when you don't have any important events coming up! I was however very impressed with the results of the samples of other products (various AHAs) I ordered at the time, so I still think Paula's Choice as a brand is excellent, as is the advice she gives, this product is just a disaster.---Customer Care: Thank you for your feed back. We are sorry to hear about your experience with this product. Please contact our Customer Service Team for a full refund and for assistance finding an alternate product that meets your needs. I have normal/combination skin that used to have acne and is now prone to the odd breakout. Paula's Choice BHA 2% products have been a lifesaver for my complexion and this is the best of the rest. The texture is more emollient than other PC BHA 2% products but it absorbs easily. I use it daily and dab a bit extra on when I've got a spot or two and within a day or so the blemish is noticeably reduced. Word of warning: the bottle is prone to leaking and does so in my bag every time I take it away with me, so keep upright. All in all, an outstanding product. Charlotte - Ended up loving it! Just wanted to update with my experience of this product, I think I was a little hasty with my overall review because after a month or so of use it's become a HG product. Because I'd been using the 2% BHA gel so long I presumed this would be fine to jump straight in with but I think the liquid is a little harsher and my skin just needed to adjust. Charlotte - Wanted to love it. Customer Care: The Clear extra Strenght Targeted Blemish Relief Toner has the same formula as our 2% Beta Hydroxy Acid Liquid. Use the BHA product that will produce the best results for your skin type. We recommend starting with a 1% BHA concentration before moving to a 2%, unless you have very oily skin and stubborn, persistent breakouts. Please note: It is best to gradually build up use of a BHA product, starting to use it a couple of times a week only. If there is no adverse reaction this may be increased to every other day at night and then, if you wish, every night. Some people increase use to twice daily (morning and night) but it really all depends on the condition of your skin. You need to experiment a bit to see what suits you best. One thing is important: when you use a BHA product (or any other exfoliant), you should always wear a sunscreen during the day. Thank you Paula for educating me about not using irritants on my problem skin. I have struggled with adult acne for 20 years and I have finally understood why over-the-counter and other irritants-containing products never worked for me. This 2% salicylic acid solution is silky, light-weight and non-drying. I also use the CLEAR Normalising Cleanser and Skin Balancing Moisture Gel in my routine, and within a week of use I can see a huge difference to my skin. My spots are healing (faster than usual) and no new ones are appearing. For the first time in years I feel I have control over my skin. I've been using this along with another BHA product only for 4 days and I've already noticed my skin is much smoother and its redness is reduced too. I'm very impressed. I've only ordered trial size and sample size so far unsure of how my very sensitive skin would react on the products, but sure will order again. Really impressed with the BHA and AHA range product, ordered non-trial sizes. One major downside is that the packaging for trial sizes, which are perfect for travelling, is very poor - the BHA leaked and contaminated my other products in the same plastic bag (lucky it was in a plastic bag). It's acidic so it caused problem when it leaked. Very disappointing - would have had a five star otherwise. Customer Care: Thank you for your review. We are sorry to hear about the leaking product. We will contact you by email to offer you compensation. I have tried other salicylic acid toners in the past, but this is the best I've tried: it is effective but non-irritating. I noticed smoother skin and clearing of blocked pores within days. I have pretty robust skin, with mild to moderate acne, and hoping that using this in careful conjunction with benzoyl peroxide will help keep me clear. Aqua, Methylpropanediol (hydration), Butylene Glycol (hydration), Salicylic Acid (exfoliant), Polysorbate 20 (texture-enhancing), Camellia Oleifera (Green Tea) Leaf Extract (skin-soothing/antioxidant), Tetrasodium EDTA (stabilizer), Sodium Hydroxide (pH balancer). 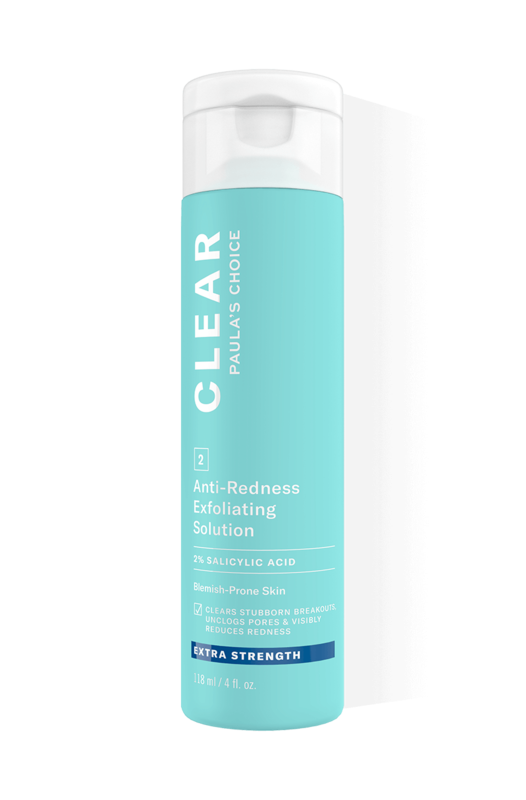 Is there another Paula's Choice product which is similar to the Clear Extra Strength Anti-Redness Solution Exfoliating 2% BHA? Our Clear Extra Strength Anti-Redness Solution Exfoliating 2% BHA has the same formula to our Skin Perfecting 2% BHA Liquid Exfoliant. What is the difference between the Clear Regular Strength and Extra Strength Anti-Redness Exfoliating Solution? The difference between the Clear Regular Strength and Extra Strength exfoliant is mainly in the texture and the rate of absorption. While both products contain 2% salicylic acid, the Regular Strength has an lighter, water-like formula and is milder with a slightly higher pH than the Extra Strength. The Extra Strength penetrates faster into the pores and has a lower pH which effectively battles stubborn break outs.